The industry hopes for a comeback amid oversupply, competition from cultivated berries. 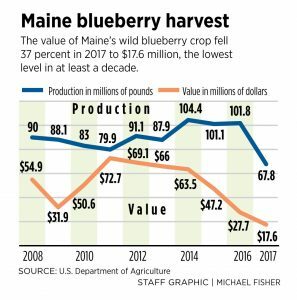 The per pound price of Maine’s wild blueberries sank to its lowest point in more than three decades last year, as growers struggled with competition from cheaper Canadian producers and a thriving cultivated blueberry industry. Maine berries fetched 26 cents per pound last year, the lowest price since 1985, according to University of Maine data. The estimated value of the harvest was $17.6 million, a 37 percent fall from 2016 and the lowest value in a decade, according to recently released U.S. Department of Agriculture data. Growers harvested 67.8 million pounds of berries in 2017, a 33 percent drop from the year before and the smallest harvest since 2004. The price collapse followed a decade of steadily growing yields in Maine and Canada that created oversupply in the market. Maine produced more than 100 million pounds of berries a year between 2014 and 2016. The value of the harvest four years ago was $63.4 million. Maine growers face competition from cheaper Canadian wild berries and a booming cultivated blueberry industry. Canada produced 206 million pounds of wild blueberries last year, about 21 percent of North American blueberry production, according University of Maine statistics. Maine, the only U.S. state that produces wild blueberries commercially, made up 7 percent of continental production. The number of North American acres devoted to cultivated blueberries doubled in the last eight years, and the yield was about 691 million pounds in 2017, the National Blueberry Council reported. Soaring demand for blueberries has encouraged year-round production of fresh berries in North and South America, said Nancy McBrady, executive director of the Maine Wild Blueberry Commission. Cultivated blueberries are resilient to long-distance shipment and are primarily aimed for the fresh market, but with surging production more cultivated blueberries are ending up in the freezer aisle, historically the preserve of wild blueberries. Maine’s blueberry industry should come through this year on better footing, McBrady added. The federal government has agreed to buy almost 9 million pounds, and limited production this year and last should get rid of the current oversupply, she said. But McBrady and Yarborough warned that the current downturn could drive some people out of the blueberry business altogether. The industry continues to aggressively market “the better blueberry” and tout its health and nutritional qualities. “The industry is going to survive this, but it is going to look different,” McBrady said.